BBC NEWS | UK | Magazine | Can you keep ship-wrecked goods? Can you keep ship-wrecked goods? Beach-combers have been told to stay away, but scavengers are out on Branscombe beach in Devon, where booty is washing up from the stranded ship MSC Napoli. So can they keep what they find? 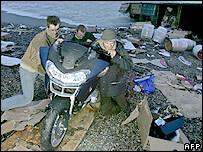 Brand new BMW motorbikes have been wheeled out of the shingle by keen treasure-hunters. Wine casks, perfume and car parts littering the shore have been rolled clear or tucked under the arm. People are picking through the contents of spilt containers from the cargo ship MSC Napoli beached off the Devon coast and at night, the area is lit by flickering torches as they scour the area for goodies. Warnings that chemicals such as battery acid, pesticide and oily liquids have also washed up, are proving little deterrent against the lure of "free stuff" littering the beach. But can people keep it? So far, police have not closed off the beach to stop them coming. And there is, says Stephen Askins, a partner with maritime lawyers Ince and Co, a right to salvage property. Someone could argue they are recovering goods from the beach to protect them, as they would be in a poorer state come four or five tides' time. But, before they clear the car boot and head to the coast, they should be aware of the Merchant Shipping Act 1995. It states clearly that if they try to conceal or keep the booty they are breaking the law. If they ignore the advice to leave it alone and report it to the coastguard, they must fill in relevant paperwork. But that still doesn't allow them to keep it. The goods still belong to their owners, whether they are stuck in containers on the stricken vessel, or washed up on the shore. Contractors have already been brought in to clean up the beach and return anything to its rightful home. But when Joe Public decides to "help", as seems to be the case all over Branscombe beach, the Maritime and Coastguard Agency's Receiver of Wrecks steps in. The job title goes back to the previous 1854 Merchant Shipping Act, which also set out rules on picking up flotsam and jetsam. Salvage, and indeed deliberate wrecking of ships, around our island nation has a long history. The principles governing ownership and recovery go back at least to the 1300s says Alison Kentuck, the MCA's deputy receiver. If people take the cargo, they fill in a "report of wreck and salvage" form, with their contact details, what they found, where and when. "It's available from pretty much anybody in uniform down on the beach", she says. Her role is then to reunite owner and property. A reward to the finder could be offered, depending on the value of the goods, the condition they are in after rescue, and the effort involved in recovering them from the beach. Wheeling something home, she stresses, is "not classed as a huge amount of effort". Hiding the goods and not giving them back is a criminal offence, with a possible fine of up to £2,500 per offence. Plus, the hot-fingered beach-comber, would waive their right to a salvage award, and have to pay the owner twice the good's value: "In the case of a BMW motorbike, it could be quite expensive". As for paddling out to see what the remaining 2,000 containers may hold, it is of course highly dangerous. And, would-be pirates note, there are official salvors charged with recovering the cargo stuck at sea, and the damaged ship itself. Add your comments on this story, using the form below. Devon will have some wonderful car boot sales this weekend. The law should be changed for large vessels such as this. Persons locating washed up goods could have the right to keep them. This would help encourage the shipping companies to get their act together and take better care of their cargo. It is good people are going down to retrieve the washed up items, good on them. If I lived any closer I know I would be there right now taking anything I could. And it is not against the law to do this, as long as you keep the salvaged items on show. Anyhow, companies such as BMW will not be asking for the motorbikes back. Once these bikes have been in the salt water the insurance company would write them off. 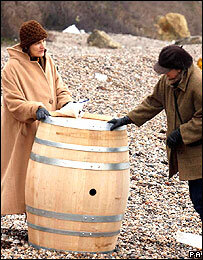 I do not condone pirating, but if I happened to come across an oak barrel of wine, I'd drink some and give some. Removing items from the beach that have obviously been washed ashore from the damaged vessel, is no different that walking into a store and helping yourself to goods on the shelves. The local police and maritime authority have an obligation to close the beaches to not only prevent the ongoing looting but also ensuring no member of the public is injured in pursuit of bounty. I think the salvagers should be rightfully allowed to keep the goods collect from the beach. It is just the same as someone with a metal detector scouring for old loose change. Interesting story but I wish you were reporting on the dead dolphins and oiled sea birds that are washing up on Chesil beach in Portland, Dorset..
Has nobody ever read Whisky Galore? I'm just of to book my train ticket to the beach and I would like to reserve that bit just by the cliffs to pitch my tent. Here in Shetland any wreck was assumed to be fair game for anyone who wanted to acquire a part of the cargo. In one district over 100 years ago where a vessel called the Gudrun was wrecked the cargo produced so much booty for the locals that for many years after anyone who got an unexpected acquisition was said to have got a Gudrun. In another incident the Customs officer who arrived to remonstrate with the people removing goods from a wreck returned to his car to find it had mysteriously levitated over a wall. As a retired police inspector, I would advise you that in Scotland this would be classed as theft by finding. A finder's responsibility here is to hand such goods to the police as found property immediately or as soon as reasonably possible thereafter, or alert police to your find. A finder may receive a small percentage reward from the owner, and if not claimed within a specified period, the goods can be returned to the finder. This is a fair system, but the unlawful retention of someone else's property is a criminal offence. I would suspect that if these containers contained valuable jewellery more would be done about the current looting. If I loose something on a beach and someone else finds it, that's my tough luck and I learn to be more careful in future. But here, the mistakes of the mariners and those who chose to beach the ship here is somehow rewarded with legal protection? If they still have rights to the cargo, then they must also be held directly responsible for any damage that it causes and the cost of any cleaning up. Maybe as a gesture to the local environment and wildlife that this will undoubtedly harm, all the people who salvaged all the interesting stuff could all pop back to help out when the real damage is realised by all the uninteresting stuff (chemicals etc. ).